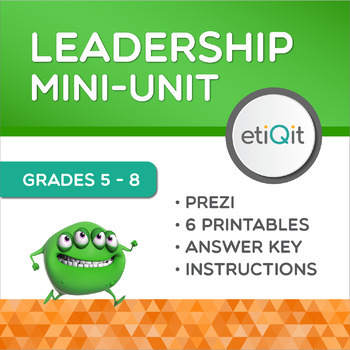 Help students learn the skills they need to become successful youth leaders in their school or community with this mini-unit (called a Qit). Students will learn specific leadership development strategies including how to: seek out and join groups or clubs that complement their passions and personal strengths; use work ethic to gain experience and bring value to a group; build trust and respect within a group using assertive communication; develop a vision for how to improve the group; and ultimately become leaders by running for office or planning an event. 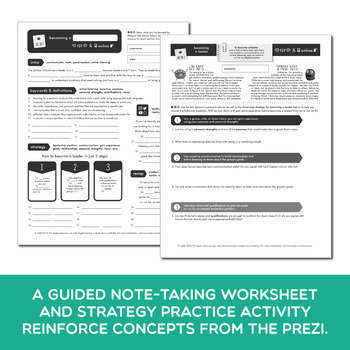 If your students have leadership potential but need the confidence, direction, and motivation to take action, this resource can help! 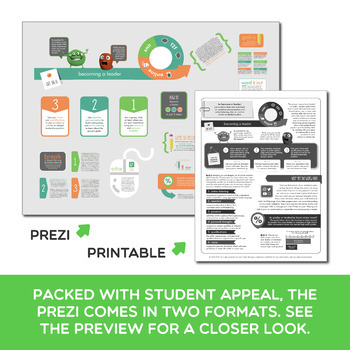 Extension Activity: The attention-grabbing, island survival theme of this activity (inspired by the popular reality TV show Survivor) will keep students engaged as they review and extend concepts learned in the Prezi. 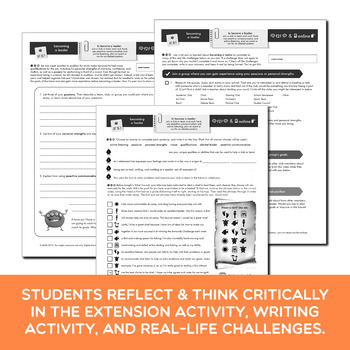 An included QR Code allows students to access an online incentive once this activity is complete.